If you are a Holocaust survivor with a grandchild and you seek to fulfill the awesome responsibility of perpetuating the memory of The Six Million, you face a great conflict and challenge. You cannot only discuss the Holocaust in the abstract but, rather, you need to share the experiences you and your family personally endured. But telling Jewish children about the cruelty done to Holocaust survivors only because they were Jews is antithetical to a child’s need to develop basic trust. The following article is a collection of my reflections on this issue, based on years of study and professional experience. 1) When would it be appropriate to bring up the Holocaust with a grandchild? 2) What, as a survivor, am I trying to teach this youngster? 3) How is the best way to convey the Holocaust to him/her? In response to the first question, the choice time would be to wait until a grandchild asks questions, is reading books, like Anne Frank’ s Diary (often between the ages of 9 and 11), or is watching films related to the subject. At that point, you should answer questions in an age—appropriate manner. In other words, provide as much information as the child is able to absorb, and provide balance. For example, if you tell a child you were thrown out of school during the war and a child asks, “Can this happen to me?” tell the youngster that, in (or wherever you reside), everyone has a right to a non—discriminatory education. These moments, when children ask questions, are often spontaneous. They cannot be planned in advance. You may be driving your seven—year—old grandchild and his friends to a soccer game and someone may yell out, “Who was Hitler?” Or your grandchild may be expressing racist or hateful remarks about “other” children. This may be an opportune time to share that when you were growing up children did not like you and beat you up after school because you had curly dark hair. Teach your grandchild how important it is to be tolerant of other children who may be different from him or her. As for the second and third question, what and how to teach, I believe that the focus should be on the values and culture of the Jews who were murdered, on their resourcefulness and resistance, rather than on their victimization. 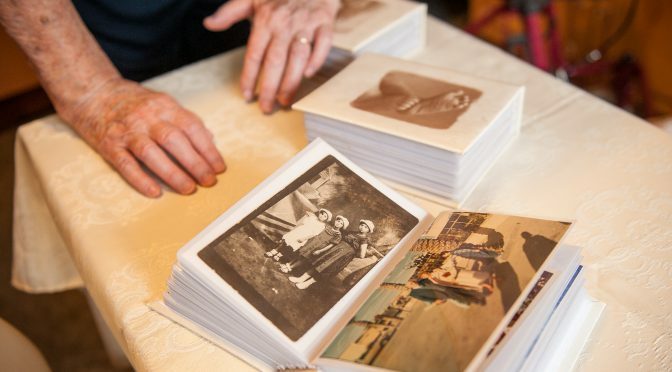 A Holocaust-survivor grandparent is a link to the Jewish past that was destroyed. Explore Jewish traditions with your grandchild. Plan and take a trip together to a Jewish museum, cultural festival, book fair, Klezmer concert, or to Israel. By providing a positive identity as a Jew, rather than just talking about the Jew as victim, the grandparent will strengthen the child’s Jewish consciousness. The danger of telling a child about the Holocaust before providing him or her with positive Jewish experiences is that a child will associate Jewishness only in negative terms and ultimately may not want to identify as a Jew. By providing positive experiences, the child will have enough knowledge about being a Jew so that their view of being a Jew is a rich and varied experience, and is not defined by victimization. Of course, there are specific problems for some hidden children who were themselves robbed of their Jewish culture and identity. What kind of Jewish memory can be shared by a survivor who was raised as a Christian, and who only discovered his or her Jewishness later on in life? Or what about hidden—child survivors who continued, until recently, to hide their Jewishness? Or a child survivor who continues to struggle with dual loyalty to Christianity and Judaism? This dilemma can be turned to positive use by committing yourself to studying and exploring these issues together with your grandchild. If you have struggled with questions of belief and of G-d and have come to a conclusion, do not stifle the child’s quest for answers. Dogmatic conclusions, such as, “after what I went through I know there is no G-d,” restrain a child’s quest for her or his own answers to existential questions. Children need to believe in a higher being, and to have some faith. If you were fortunate to be saved by Jewish or non—Jewish rescuers, remember these people by recalling to a grandchild their good deeds. Describe them as flesh—and—blood human beings with faults and strengths. If children in a rescuing family were involved in your survival, do not forget to include them in your story. With respect to survivors who were hidden as children, their experiences rarely had happy endings, even though they survived. Their traumatized childhoods were punctuated by the losses of dear ones. Nonetheless, if at all possible, balance the tragedies with a note of optimism, focusing on the ability of an individual to overcome adversity and to go on to have a fulfilling life. Keeping in mind the child’s needs for both knowledge and hope, for consciousness of the Jews’ catastrophe and of its vibrant culture, for hope in humanity and the need to respect others, survivors can meet the challenge of telling their grandchildren about the Holocaust and their experiences in it in a meaningful way. Eva Fogelman, Ph. D. is the author of Conscience and Courage: Rescuers of Jews During the Holocaust co—edi tor (with Judith Kestenberg Children During the Nazi Reign : Psychological Perspective of the Interview Process.